The Fraunhofer Institute for Molecular Biology and Applied Ecology (IME, Münster branch), the Institute for Plant Biology and Biotechnology of the University of Münster, and the Tyre Division of Continental in Hanover are successfully collaborating on a project entitled "RUBIN – Industrial Emergence of Natural Rubber from Dandelion". 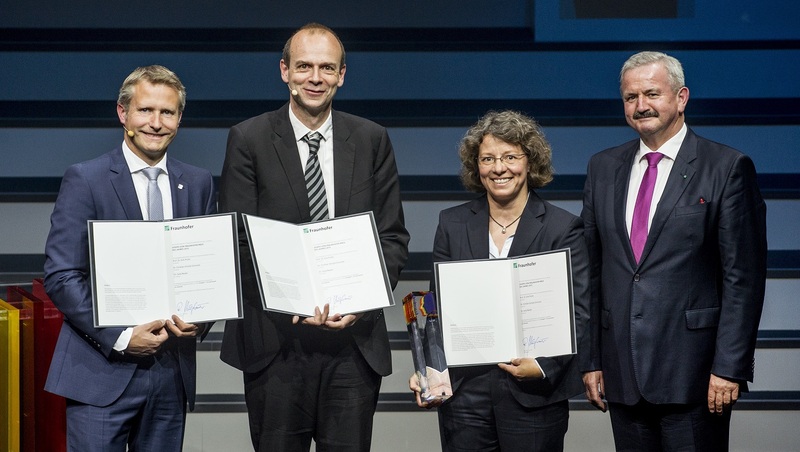 The leading scientists in the project have now been awarded the prestigious Joseph von Fraunhofer Prize for their research on the Russian dandelion and the development of car tyre prototypes based on dandelion rubber. The award was presented yesterday in Wiesbaden, Germany, to Prof. Dirk Prüfer and Dr. Christian Schulze Gronover (IME and Institute of Plant Biology and Biotechnology), and Dr. Carla Recker (Continental). "The objective of this joint project is to develop a procedure for the industrial use of dandelion as a source of rubber. In agricultural terms, it is an undemanding plant, even in the northern hemisphere, and can be cultivated on land not suitable for food production. This means that rubber production is conceivable near our tyre factories, for instance, and the significantly shorter transport routes would also reduce CO2 emissions," comments Dr. Carla Recker, who heads the Continental team involved in the development of this promising material.